Ais Mc: Night Time Skincare: Your new best friend. 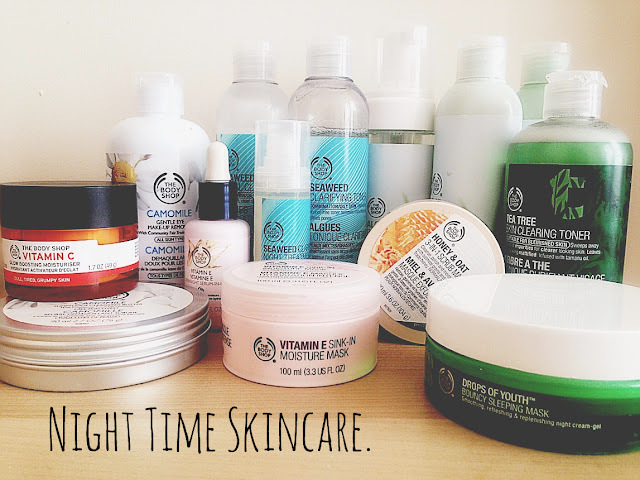 Night time skin care can be a daunting, with so many products promising us the world (and most of them costing an arm and a leg!) it's easy to get overwhelmed. But it's a necessity. At night time, your skin can be clean and fresh and focus all it's energy into absorbing the goodness you put on it, instead of trying to protect itself from the sun, dirt, makeup and general wear and tear. The first step in any effective night time routine is double cleansing (shout out to Caroline Hirons for this beauty gem!). As she rightly says, make-up is designed to stay on your face - take the time to remove it. Whether this be removing your eye-makeup and face make-up with different products, or simply using an oil cleanser and then a wash, you need to do it. (But NO WIPES). Leaving traces of dirt on your face will only lessen the effect your over night products will have, and that's just waste! So start double cleansing. Toning is also a beneficial step that not everyone loves. It simply removes the final traces of grime and the light consistency leaves the skin feeling refreshed and prepped for moisturiser, so it really is worth your while. Which brings me to my next step: moisturising and treatments. Something I've learned through working with skincare is that layering is key. It's highly unlikely that one product will sort out all your skin woes, so what's the solution? Layer the products that you need. You'll use less of everything and actually combat your problems. When layering, it's key you apply serums first as they have a lower oil base formulation meaning they can penetrate deeper into the epidermal later. And by applying them first they actually enhance the effect your moisturiser has. Woo! Regardless of how many products you're applying ensure you use the thickest moisturiser last. It will help to lock in all the goodness from serums and oils you've previously applied. And you're done. Skin care doesn't have to be this crazy world of mystery. When you've found a routine and products that suit you try your best to stick to it. The payoff will be unbelievable! This is coming from a girl who used to swear my using face wipes to remove my makeup (the shame! ).